Type of wine: Rich, noble, elegant red. 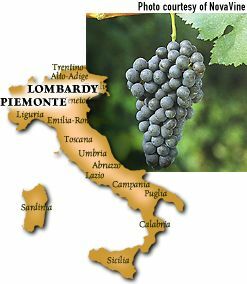 Origin: Arguably Italy's most noble red grape, Nebbiolo is grown only in a small section of Lombardy and in Piemonte, where the best wines are named for their principal villages: BAROLO, BARBARESCO, GHEMME and GATTINARA. (In the latter two districts, the grape is called SPANNA, and blending with up to ten percent of several other varieties is allowed.) Lesser wines made outside the approved appellations (D.O.C., Denominazione di Origine Controllata, and D.O.C.G., Denominazione di Origine Controllata Garantia) may be labeled simply as NEBBIOLO or may carry a specific place name, such as NEBBIOLO D'ALBA. Description: Deeply colored with a robust aroma redolent of black fruits, tar and leather. High in both tannin and acidity, it takes a skilled hand to produce quality Nebbiolo that is both enjoyable in its youth and capable of refinement with extended aging. Mature wines display a brick-red/garnet hue and offer an enticing bouquet of dried roses and violets. While the wine is typically bold and aggressive in style, Nebbiolo can also be made in a lighter vein, examples being Gattinara and Ghemme, which are reminiscent of red Burgundys from the Cotes du Beaune or Pinot Noirs from California's Russian River Valley. Aging: No other red wine more magnificiently rewards patient cellaring than great Italian Nebbiolo, which can develop into a beverage of beauty after decades in the bottle. The most robust California Nebbiolos age well for five to ten years while more "feminine" renditions should probably be enjoyed a few years earlier. Best location: Like the finicky Pinot Noir, Nebbiolo is extremely site-sensitive, difficult to grow and tempermental in the cellar. Some winemakers say it is the most difficult wine grape to work with. It prefers cooler areas with warm-to-hot daytime temperatures and a high degree of luminosity. Also like Pinot Noir, Nebbiolo is usually not blended with other varieties, but boasts multiple clones that are often inter-planted, thereby imparting complexity to the wine's aroma, flavor and structure. While there are some quality Nebbiolos being made today, the best sites are probably yet to be discovered, and wines of Piemontese caliber are yet to be made. FastFoodFacts: Good Nebbiolo will tame the richest, heartiest meats, stews and ragouts. Double or even triple decant a robust youngster a few hours before dining to allow aeration to develop the wine's aromas and soften its flavors. Be sure to leave a portion to enjoy with a post-prandial plate of an aged hard cheese like Asiago or Grana Padano.